Selena Gomez shared this behind-the-scenes photo of her primping for a concert in Dubai on her Instagram on Sept. 27. In the pic, she’s showing off a pretty Henna tattoo on her foot! Do you love her latest look? Selena Gomez is so connected to her fans! She posted a backstage photo of her getting her hair and makeup done on her Instagram. She wrote: “Gettin beautified for ya Dubai music week. 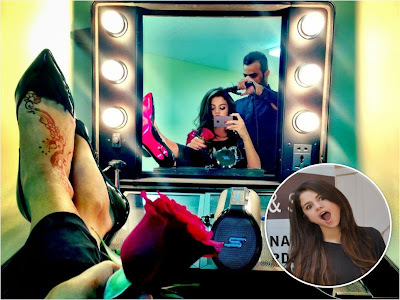 Selena was sitting pretty in her makeup chair as she got ready for her Dubai concert on September 27. She was looking gorgeous, with black eye makeup and a red lip. She was also rocking red nail polish. She was wearing black pants and had on black patent leather Christian Louboutin pumps. As she posted the photo, she was getting her hair done. It seems like Selena is planning on rocking her signature wavy locks on stage! On her foot, Selena revealed a really pretty Henna design. The temporary tattoo went all the way from her toe to her ankle. We love how she is experimenting with beauty trends in other cultures. Remember all the bindis she wore while promoting “Come & Get It”? After her Dubai concert on Sept. 27, Selena gets a break. Her next show is on October 10, back in the USA in Fairfax, Virginia! Are you loving Selena’s beauty look? Do you like how she shares behind-the-scenes photos with her fans, HollywoodLifers? Tell us below.